#1 First thing on a Monday morning, Jemima woke up to some rather intriguing news. The Shoohoos informed her over oatmeal that a 'Winnie' was coming for a visit...some time this week. That's what they said, and nothing more. Since Jemima loved visitors, and especially mysterious ones, she shrugged off the Shoohoos lack of details, and immediately set about cleaning the Doll Room. Top to bottom. And everyone was expected to help, except Bee With Me. Bee was asked to make a dozen welcoming treats with extra honey to present to the visitor. Mr. Ted was excused from cleaning too, so he could make the frosting. Tella unusually offered to take the garbage out, and on the way fully tested two of the treats before they were cooled. Well, one day turned into another...and another. Yet no one with the name of Winnie showed up at the Doll Room Door. Finally, on Friday Jemima was becoming exasperated. The frosted honey treats were almost gone and it was really hard keeping the doll room clean. So she took everyone on a very long bike ride. To keep things tidy one more day, and to keep her mind off the visitor who had not. shown. up. yet. But! When they returned...she found the doll room window wide open and a shadow of someone was peeking at her from behind the cabinet!! "She came in through the window!" she whispered to the Shoohoos. "Well of course...she did", Beeps replied. He looked at Winter with one raised brow and together they comfortably settled in on the couch. Along with the elephant and the bear, to watch as the two girls looked intently at one another. #2 Momentarily, for the second time in her life, Jemima didn't know what to do next. Or how to say it if she did. But all that changed when she noticed multiple acorns strewn across her week-long, perfectly clean carpet. Jemima couldn't help it...suddenly she fired off questions one after another..each louder than the one before. "WHY did you come in through the window and not the door??" "WHY are you hiding behind the cabinet????" "AND WHY are there ACORNS ALL OVER THE FLOOR????" Again infuriating Silence. In the shadows, Winnie seemed to drop her chin onto her chest. Outside off in the distance, at the edge of the lavender field, a flash of what looked to be a white dress disappeared into the forest. Back inside the Doll Room there were too many questions and not enough answers. Everyone was frozen in their places, even Beeps and Winter were sitting like statues on the couch, barely breathing. In perfect Jemima form, she put one hand on each hip, rolled her eyes and sighed "SHE JUST WON'T COME OUT...NOW WHAT!!!" This visit was not turning out at all the way she thought it would. "Jemima, give her the special treat Bee and Ted made...we still have one left!" Sheepishly, Jemima took her hand off her hip and offered the pretty little pastry to Winnie. #3 To everyone's surprise, a young girl with pointy ears stepped forward from the shadows. In a shy child-like voice she said, "Perhaps I have come to the wrong place, and I beg your pardon if that is so." 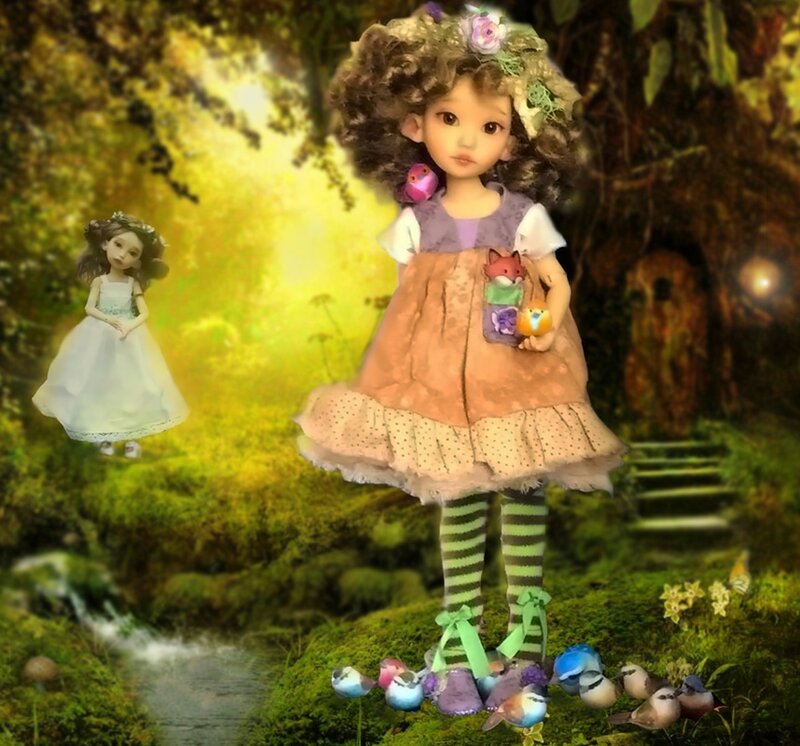 As she spoke, a breath of fresh air blew in from the lavender field and seemed to calm the tension in the Doll Room. A small flockling of blue and green birds landed on the window sill. "Your garden birds brought an urgent message to my home in the Ancient Oak Forest, an alert that there was grave trouble and a Shoohoo was requesting help. So my sister and I left immediately, following them to this very window!" Jemima's face was confused... "But Beeps and Winter told us you were coming for a VISIT. Isn't your name Winnie?" "Oh yes, I am one, and my sister Joy is another. My name is Winnie Shushu because I walk through the forest and do not disturb a living thing. My sister protects Joy, so that is her name and she will not forsake it. I fear she has run away and is headed to the blue hills of Kentucky." The Shoohoo boys were squirming, and trying to hide behind the pillows. Winnie continued, "When we arrived, there was no one here to greet or receive us. And it seems that you do not understand the acorn gift we have brought to help you." Looking at everyone around the room she added, "But it seems your trouble has been solved. " "Trouble ... Acorns?? None of this makes any sense at all!" Jemima was peering at the two sets of wide open Shoohoos eyes. Then quite suddenly, Beeps' muffled voice wailed from behind a pillow, "We didn't mean for this to happen, Jemima! Winter and I DO know about the Winnies, but we didn't think they were real. Or this BIG!" "Alright...alright...this was all Winter's and my fault! Last week, while we were weeding the garden, Winter was complaining about how messy the Doll Room was. Then we tried to remember the last time we had dessert after dinner. We couldn't. So I quietly and PRIVATELY said to MYSELF..." he paused to glare at Winter, "that if only we had a Winnie around, things would be different. Winter heard me and would not stop laughing." Winter quickly added, "So he yelled, and I mean LOUD, at me that the condition of the Doll Room was not a laughing matter...but was a SERIOUS community problem!!" "Obviously one of the garden birds must have heard you loudly complaining, Beeps ...and flew off in a panic to find the real Winnie! ", Patti reasoned. Winter continued to explain, "When Beeps and I were babies in the nursery, our Grandmother would read old Shoohoo folk-tales to us before bedtime. Our favorite story was about a faerie family whose daughters were all called Winnie. Each sister had a different middle name, and that was what she was known by. They could save a Shoohoo from any disaster and solve the darkest mystery. We begged our Nan to hear the stories over and over and thought for sure they were real. But as we grew older, we figured out that Winnie lived only in our imagination." "So...we came up with a plan to create our own Winnie." Beeps said," We would tell Jemima that a mysterious girl named Winnie was coming for a visit within the week. She would hurry and clean the doll room spotless from top to bottom, and ask Bee and Ted to bake a huge batch of welcome desserts for all of us to share. Then we would leave Patti's toy Unicorn at the door on Saturday morning and tell Jemima that a "Winnie" had arrived for her visit... problem solved! " By now, Patti had her hands on her hips, "Well, now your grand plan has caused an even worse problem, you naughty Shoohoos. Because the REAL Winnie has come all this way over hill and dale to solve your urgent problem. Which was not so urgent after all!". All eyes turned apologetically to the real Winnie in the room. But rather than being angry with the inhabitants of the Doll Room, she was warmly smiling at the Shoohoos. Someone began to giggle...and before long giggles filled the room. At last it seemed that Winnie was feeling welcomed by all. Beeps had one more question, "So...ummm...are there really more Winnie sisters?" And Jemima still wanted to know, "And what does all this have to do with acorns?" ​#5 "We are elves and not faeries!" Winnie laughed, "We are NOT magicians, nor are we mysterious at all. Your blue bird friends did lead us to the right place though." She sat down next to Winter on the couch and said, "Before I leave, we must gather the acorn mess off the floor! " Jemima agreed and was the first to begin picking them up. "The acorns are a gift from the Ancient Oak Forest, and were meant for the Shoohoos. But there are enough for every one here in the Doll Room to have their own. Be careful to plant your acorn in soft soil somewhere close, so you can see what happens as you water and care for them. Watch how the saplings will soon spout...and notice the little blessings that will begin to happen. Before long, your tiny acorn will grow into a mighty tree and bring even bigger blessings. It will bring you new friends who will thrive in it's branches. The trunk will provide protection in the storm by it's thick bark, and the leaves will cool the scorching heat. Your oak tree will gladly share it's acorns with many creatures for their winter food." "You came all this way to give us acorns, and we have to wait for the trees to grow?" Tella asked. Winnie smiled, leaned over and looked Winter in the eye..." You Winter are just like this acorn!" "Even though you are small...when you are planted in a soft human heart, something miraculous begins to happen too. With lots of love and careful tending, you will inspire small fanciful ideas in your human's heart that will be shared with their friends...which will inspire even more creative ideas to sprout. Over time, new friendships will be forged, joining all sorts of talents together to grow larger and become even more beautiful together." Winter and Jemima looked doubtful...."We can grow into THAT?" "Just watch. So many blessings will spring forth when you travel into new homes. You all are just like this acorn, but instead of soil you are planted in the hearts of those who love you. With a constant sprinkling of love you will grow into something as large as their imagination will contain. You are ALL little miraculous creations that will thrive and grow larger when loved and shared." "Now I must find Joy, so we can return to our home. Remember to plant your acorns and have faith that you...and they...will grow into something large and wonderful in the gardens where they are planted." With those parting words, Winnie picked up her suitcase, accepted the last pastry from Jemima, and climbed out the window. Skipping across the lavender field and into the trees, she followed after the bluebirds who would lead her to Joy.